Something is just not right with Gurley. With McVay coaching his 2 biggest games in his life (NFC championship and SB) he says that gameflow didn’t allow him to use Gurley as much? I just don’t buy it! Nor would McVay be negligent and just forget about his “best” running back. What scares me even more is that Gurley wasn’t even used as a decoy. The best players should not come off the field during the Super Bowl. Let alone split carries with a player like CJA’s caliber, that is not dynamic in 1 certain aspect of the game. Have we seen a running back completely lose their touch mid season before? If I recall correctly running backs are usually “not the same” the following year, but never during season. So strange for a player to put up monster numbers all year and then just disappear when it mattered the most. Baffles me. Do you think that most of the push back is coming from dynasty owners who are losing sleep over their investment? LOL sure seems to be picking up as a narrative in the fantasy community. Knowing how such things grow in the off-season, he'll be so overrated by summer that he'll be underrated. That's a good point. Hopefully, this issue will snowball into me being able to trade for him in that 10-12 range as you mentioned. But even if he was hurt during the playoffs what does that have to do with his performance for this upcoming season? It’s reasonable to assume if he was hurt he’d have a ton of time to recover. It’s one thing to have a hunch, and I’m buying in that hunch more and more, but it’s another thing to make a trade to offload him just based on that hunch. Maybe McVay overthought things and got too smart. who Knows. I’d think the prudent thing to do is probably wait and see his first couple of games this upcoming season - it’s better to hold on just a little longer than trade an elite RB too soon. He did have 21 tds this season, even if he drops off from that I can accept 10-12 tds. It’s not like the league is full of 3 down RBs. This is like saying “Antonio Brown has had a string of monster seasons so I’m thinking next year he’s due to come back down to earth” and then you make a trade to get rid of him. You wouldn’t do that, I mean you could it just wouldn’t be the smartest thing in the world. The smart thing is give it a couple games and if he gets off to a slow start then you say “my hunch is looking right, let me move him before it really becomes obvious”. Personally, I don't think Gurley is falling off the earth. That said, if one truly believes this is about to happen (or has a strong potential to), then now is the time to offload him while his value is still elite. If this really is an issue, it will only build over the off-season and if that carries into a stretch of bad games to start out the year his value will drop dramatically. If all plays out to what he thinks, you'll never get THEN what you can get NOW. Brown isn't taking anywhere near the beating a bell cow RB takes.... the where and tear isn't there for WR's... remember Jamaal Lewis, Shaun Alexander. Wear and tear.... Or are you guessing where the tear is? WRs don’t lose a step? That’s news to me. They don’t lose separation ability? If they don’t Dez would’ve had a ton of offers when the Cowboys release led him. WRs do lose a step. Speed decreases as they age, but in the truly elite, experience offsets the loss in speed. Route running skills and elusiveness improve. Hmmmm all this furor over MFL's / Fantasy Shark's projections for Mahomes. I am with Smitty... I think that Gurley has some big setback. Glad I don't own him. But my point is if you compare Gurley’s setback numbers, say 1200 rushing yards and 12 td’s, isn’t that above average numbers compared to the typical RB? Some keep saying set back as if they mean “completely horrible letdown” year. I don’t know about you but I’d take 1200 yards and 12 tds. That’s not “Gurley” numbers but they’re good enough. Now I personally think he gonna finish with more than1200 yards and 12 tds, thats just what I’d consider his floor. He’s still young and he’s the highest paid RB, he’s gonna be a workhorse for sure. I don’t think anyone is completely eliminating him from their draft board. Most just aren’t taking him in the top 3-5, with the added risk. Id rather take a player with as much upside and less risk. Ex: Barkley, Zeke, Mccaffrey, Kamara etc. 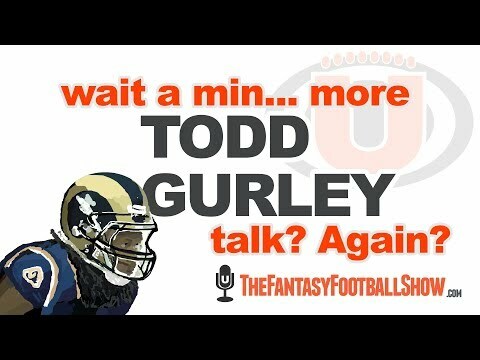 I’d take Gurley all day long at the back end of the 1st round at this point, which I highly doubt will be the case. His 2016 year was 1200 total yards and 6 TDs. I think that's his floor which isn't amazing. If he stays healthy. I think that’s the issue, the red flags feel like breakdown which leads to injury...imo. High odds of it anyway. C.J. Anderson believes Gurley's late-season knee injury was "a little bit more than what everybody in the building thought, including himself," Cameron DaSilva of USA Today reports. "I would say sprained knee," Anderson said. "Obviously, it's the same knee injury he's had before in his career. Obviously I had surgery on my meniscus and once you have a knee, you always have a knee." Analysis: Gurley and coach Sean McVay both insisted the 24-year-old was healthy throughout the playoffs, while running backs coach Skip Peete suggested Gurley technically was healthy but never regained his peak conditioning after missing Weeks 16 and 17. It's interesting to hear Anderson sound so skeptical, especially because his willingness to talk about the injury might be taken as a hint he doesn't expect to re-sign with Los Angeles. The controversy over Gurley's playoff role may not go away anytime soon, but that doesn't mean it will have any impact on his ability to shoulder a huge workload for the third straight season in 2019. Concerns about durability or volume won't push him out of the first round in fantasy drafts, but they could be enough to leave him behind the likes of Saquon Barkley and Ezekiel Elliott at the very top.